This is an exciting weekend at Spring Forth Farm. We are doing flowers for our first weddings of the year, and we congratulate Brandon & Kelly and Hayley & Jay. (Look for photos of the wedding flowers sometime next week.) It isn’t too late to order fresh, seasonal Spring Forth Farm flowers for an event or wedding this season, but we are filling up. Please contact us if you are interested. This past March, we wrote about our trip to Maryland and brought back a truckload of peonies, hydrangeas, and other perennials. We barely fit them all in the truck. 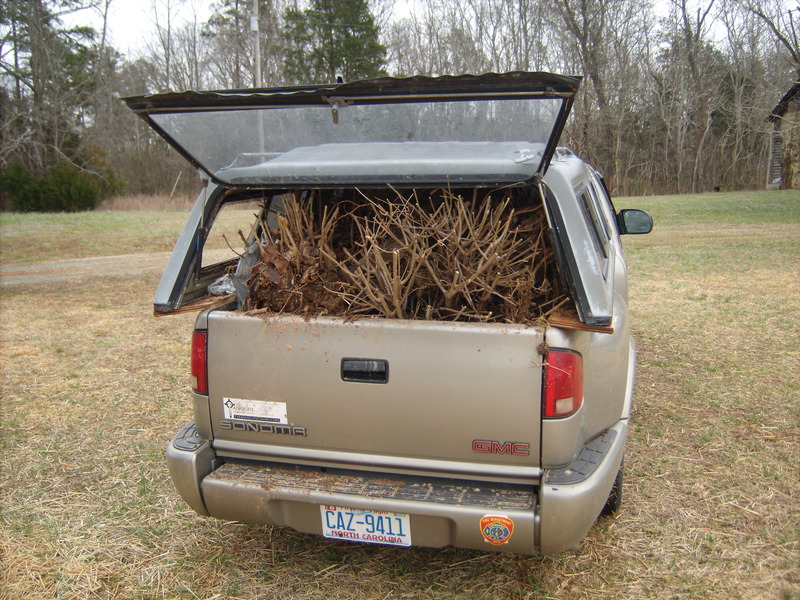 Our truck, overflowing with perennials for planting. Now, they have been planted, taken root, leafed out, and to our delight they are blooming! Here is a photo update of this excitement on the farm. We were most excited about the peonies. We brought back fifty established plants, each one a mystery. We knew we had pink, white, and burgundy, but we had no idea how many of each, or which plant was which. 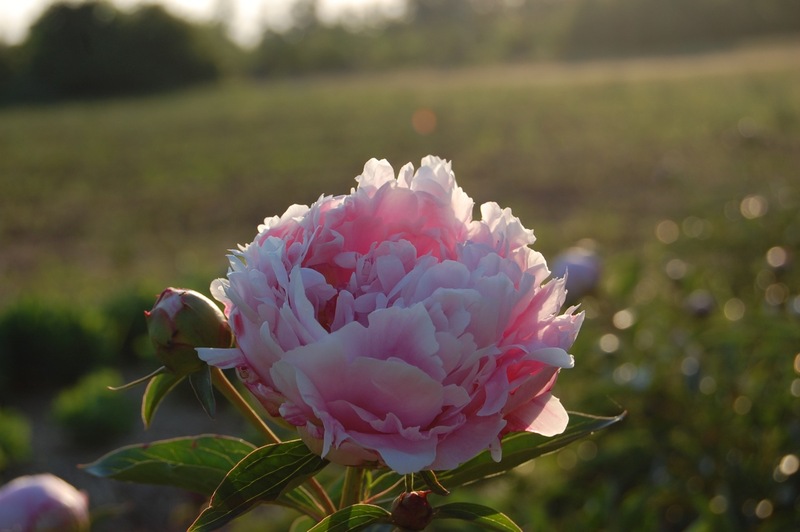 With the stress of the late transplanting and without irrigation, about half of our peonies aborted the buds, but that means about half bloomed! We were so excited about these sweet-scented balls of color. Most of the ones that bloomed were pink, but we expect we have more burgundy and white that will bloom next year. We are learning so much as we grow this year, and the importance of irrigation for these crops really hit home this spring. Digging up peonies in the rain. The peonies in bud, ready for harvest. We also brought back hydrangeas, which are starting to grow flower heads, and curly willows. The willows have been growing in trays but we’ve started planting them and are really looking forward to this great crop. Here are before-and-after photos of the hydrangea, stored in our straw pile for planting in March, and now in May. Here are the first of the rooted willow cuttings being planted out. Curly willow layed out for transplanting. Curly willow starts in the bed. When it comes to plants, we get excited about different things, but we both like to experiment. Jonathan was particularly excited that we brought back two dozen eremurus roots, also called foxtail lily. These are sort of an experiment – we don’t know if they will survive the late summer rains – but we hope they do so we can offer these unique spires next year. The eremurus has really unusual, spidery roots. Eremurus flower head ready to flower. We are really excited about nurturing and growing these perennials on our farm and dream about adding many more varieties of perennials to the farm over the next few years.